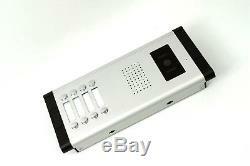 Are you looking for a high quality video intercom system for you apartment? It has 7 inch super thin LCD monitor and the IR camera is 380TV line horizontal definition, its dynamic effect is good, No radiation, low power consumption. When the doorbell is rung, the picture of the visitor will automatically be displayed. The system has 1 doorbell and 8 monitors. It supports maxi 12 monitors. 1 call button for 1 monitor, so you can call directly the room you want. > 7 Inch LCD monitor can receive the video of your visitor. > Doorbell has 380TVL good camera. 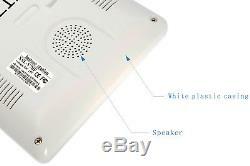 > Very Easy to install and use; > 2 Way voice talking; > Remotely open your electric door; > LED lights for seeing in the dark! > Connect the camera and receiver with RVV4 lines (not included). 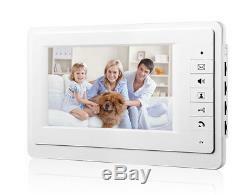 Indoor Monitor - Input power: AC 100-240V 50/60Hz - Output power: DC 5V; 1000mAh - Support Color & B/W CMOS & CCD Cameras - Volume/Contrast/Brightness control - Door release, intercom, call other monitors, monitor outside - Audio and video out & 3 Music selectable - Hand free communication - Dimensions: 24 x 15 x 2.6 cm (L x W x H) Outdoor Camera - Power: From Monitor, DC15V - Connection: 4 cored wire (Up to 12 monitors) - Camera sensor: 1/3 Color CMOS Camera - Light Source: 6 Infrared LED lights - Visual angle (U/D/L/R, degree): 60/35/70/70 - Camera resolution: 510492(NTSC), 380 Lines - Working Temperature: -13F to 131F (-25C to 55C) - Built-in microphone and speaker - Illumination 0 lux/F1.2 - Infrared length 1m - Case: Metal material, weatherproof - Working power consumption:? 20m RVV4 x 0.2 mm. 30m RVV4 x 0.5 mm - 50m RVV4 x 0.75 mm - 100m RVV4 x 1.0 mm Certification: FCC, CE. 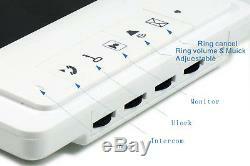 Indoor monitor x 8 outdoor unit x 1 power adapter x 8 install accessories x 1. English User Manual x 1. It's a safe and faster pay method for both of us. The item will be fully tested before sending out. We hope the feedback will be left once you received the item. We will reply you as soon as possible. 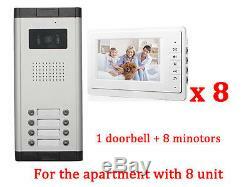 The item "8 Unit Apartment Intercom Entry System 7'' Monitor Audio Wired Video Door Phone" is in sale since Thursday, May 17, 2018. 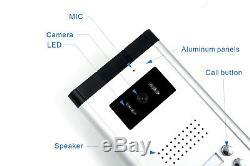 This item is in the category "Home, Furniture & DIY\Smart Home & Surveillance\Other Smart Home". The seller is "t-maxe" and is located in sz.